LOS ANGELES, CA (July 22, 2014) – You don’t have to “wait for it” any longer… the complete series collection is here as “How I Met Your Mother” – The Whole Story arrives on DVD September 23 from Twentieth Century Fox Home Entertainment. “Suit up” for all nine legendary seasons of the slap-happy show that took TV comedy to hilarious new heights. Join Barney (Neil Patrick Harris), Robin (Cobie Smulders), Marshall (Jason Segel), Lily (Alyson Hannigan) and their romantically challenged best friend Ted (Josh Radnor) for more than two-hundred truly awesome episodes. Relive all the inside jokes, crazy time-jumps, never-saw-that-coming plot twists and classic long-running gags: from the Bro Code to doppelgängers to Robin Sparkles to the infamous slap bet between Marshall and Barney. With its limited-edition Bro Code Playbook packaging, “How I Met Your Mother” - The Whole Story makes the perfect gift for the holidays. The collection includes all nine seasons of the Emmy® Award winning show along with the show’s alternate ending fans have been eager to see. A brand new bonus disc comes loaded with featurettes including a complete series retrospective documentary of the series, a piece focusing on the casting of the infamous mother, a look back at how the Mosby kid sequence from the finale was shot back in 2006, the San Diego Comic-Con introduction and panel from 2013, a live table read of the touching series finale and an in-depth look at “The Pineapple Scene” where the mystery of the pineapple is FINALLY revealed! That’s not all! Suit up and give one last high-five for the awesome final season of “How I Met Your Mother,” available in The Whole Story and individually on DVD September 23. Surprising answers to hilarious questions will be revealed during one epic wedding weekend. Can Marshall complete a cross-country road trip and make it to the ceremony? Will Robin and Barney really tie the knot? Is Lily hiding a shocking secret? Will Ted finally meet the mother of his children…and is she truly “the one”? It all builds to a climactic two-part series finale, leading to one of the most talked about endings in TV history. 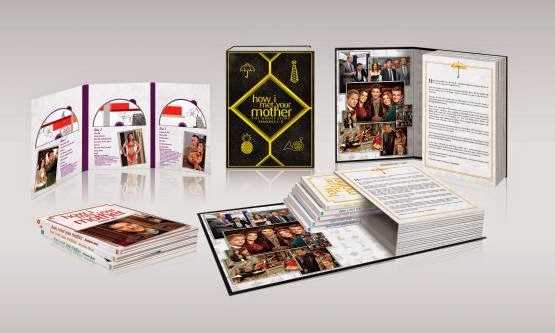 The “How I Met Your Mother” Season Nine DVD is loaded with more never-before-seen content, including the previously mentioned alternate ending, a behind-the-scenes look at the making of the finale, a “Where Are They Now” retrospective of the guest stars featured in the 360 degree sequence from the “Gary Blauman” episode, Cristin Milioti’s audition tapes, deleted scenes, three commentaries with Craig Thomas and Carter Bays and a hilarious gag reel.